In order to save some money for my, what may turn out to be rather expensive, travel plans I've been cooking from the pantry and freezer. I'm loath to admit that I love to go to the market for dinner inspiration (especially Jungle Jim's). I think I got into this bad habit while living in Europe. You stroll and troll the markets daily, looking for what's in season, available, and inspirational, and then serve it up. Sometimes I get carried away. Besides looking for what I'll be cooking for diner that evening, I become distracted by all that is shiny and new. I stock lots of staples. I also buy other enticing goodies and let them languish -- starving for attention -- on either pantry shelves or in the cold, dark confines of the freezer -- often never to see the light of day again. I'm not proud of this. It's just a fact, ma'am, a cold hard fact. Therefore, to save money, and empty the shelves for the next haul of bargains (and so maybe I can defrost my freezer sometime in this century) I'm cooking from the stockpile (granted, it's a very well-stocked pile -- I've got fresh frozen Oregon truffles and whole fois gras in there). I've been cooking like this for weeks and weeks. And, except for greens and fruits, I've seriously cut back on my food expenditures and managed to save quite a bit of money. It's scary how much money I spend on stuff I never get around to cooking. I've had to become uber creative when it comes to dinner. Daily, I make a pilgrimage out to the freezer to see what I can see. It's been a good culinary stretch for me. Generally I don't have a steady cycle of recipes on which I rely - one's that I cook every week or even every other week. 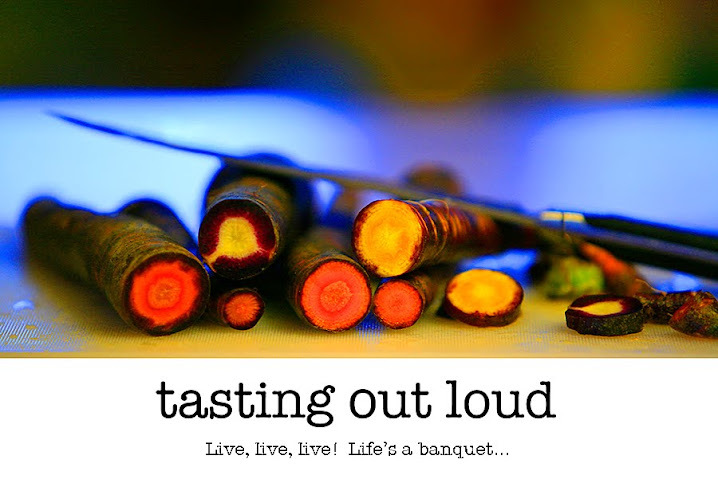 For me, that's a culinary stupor. Can't stand eating the same thing over and over, and I'm not too big a fan of leftovers, although I will eat them for lunch. But not leftover dinners -- not if I can help it. Monthly is the most repeating I'll do. This evening's Pantry offering is Spaghetti and Meatballs (with an Artichoke/Arugula salad which will be covered in the next post). The meatballs are Aidell's Italian Style Meatballs with Sun Dried Tomatoes. They had been in the freezer for a few months -- their frozen entombment the direct result of a tasting at Jungle Jim's. It was time to free them from their frosty limbo. These little gems are delicious -- absolutely the best ready-made meatball I've ever tasted -- bar none! Great texture. Great flavor. And, they were handy. If you can't find them in your market, check out Aidell's website store. The spaghetti is Ancient Harvest Quinoa Spaghetti. Quinoa is an ancient grain of the Americas and an excellent source of protein. 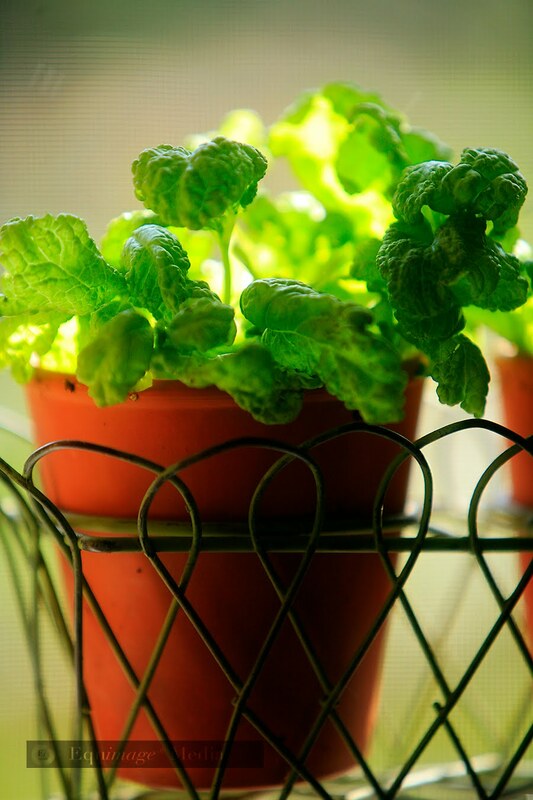 For centuries it was harvested by Native Americans and is becoming trendy because of it's versitility. It can be used like bulgar or couscous. It's great in salads and as a side dish. And this particular quinoa pasta is outstanding. This is our particular favorite. Toothsome. Great flavor. Reheats well. And packed with protein. It's a little more expensive than your run-of-the-mill pasta but well worth the added expense. It's organic and good for you! And the protein will help keep off the dreaded pasta pounds -- at least in theory. The marinara sauce is made from my home-canned tomatoes (canning - another story), onion, garlic, olive oil, dried red pepper flakes, tomato paste, salt, black pepper, and basil. I had all these items on hand and just happened to have a little fresh basil from my window sill plant. Dried would do in a pinch but wouldn't be as pretty nor the flavor as summery and robust. It's your basic chop and saute sauce. No muss, no fuss. Delicious. 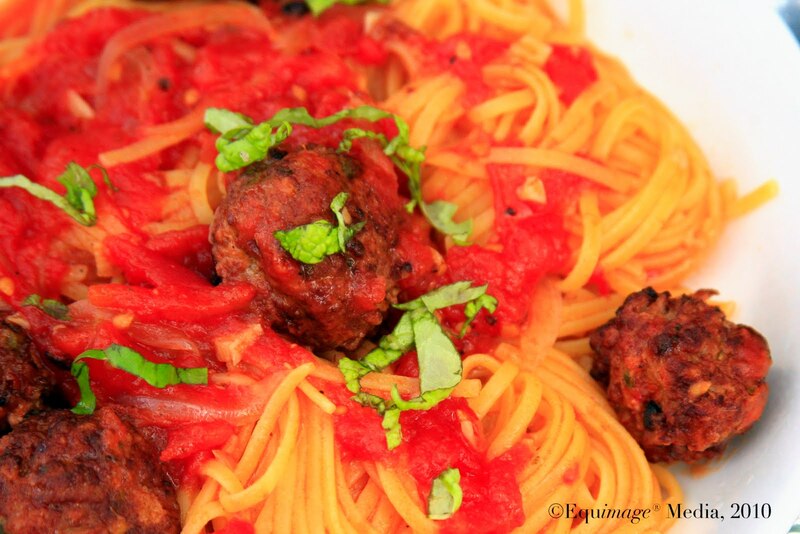 Give it a try and definitely add the Aidell's meatballs or, if you're a vegetarian add your favorite veggie orb. Serve it over the pasta of your choice and you've got yourself a great meal on the fly. Who knows, if I keep it up, all this fugal effort may just get that plane ticket into my hot little hand after all! Serves 3-4 as a main dish depending on how much pasta you require. 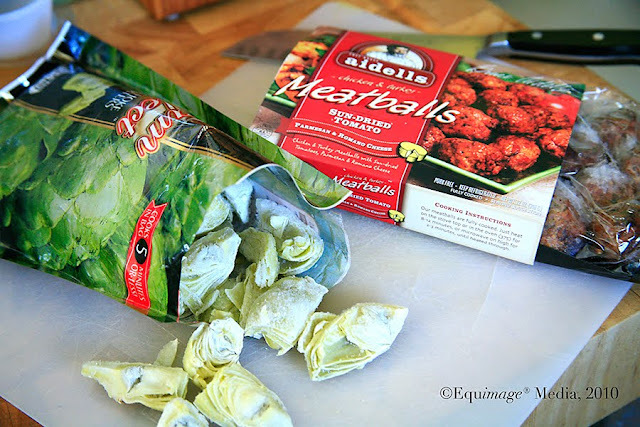 1 package Aidell's Italian Style Meatballs. In a large pot bring 4quarts of water to boil. When water boils, add 1 Tbs. salt and pasta. Cook until just barely al dente or almost to desired texture and drain, reserving 1 cup cooking liquid. Add onions, garlic, and pepper flakes, sauteing until onions are just translucent and garlic is a very light golden color. Add crushed tomatoes. Bring to a simmer and cook for 5 minutes. Stir in basil. If using fresh, reserve a bit for garnish. Add meatballs, pushing them down into sauce. Gently cook covered for five minutes until meatballs are heated through. 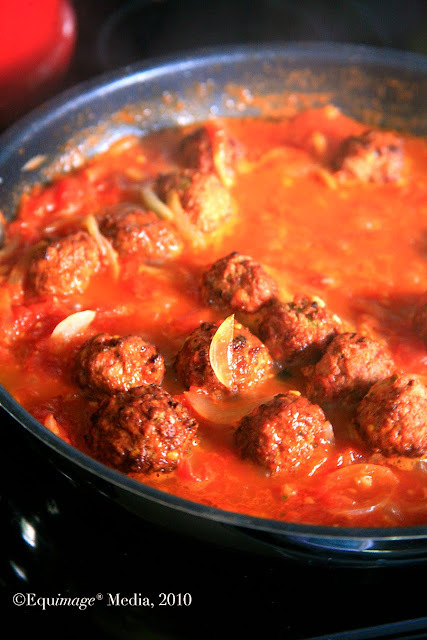 Gently simmer pasta in sauce and meatball mixture for 1 minute, adding reserved pasta water if sauce becomes too thick. 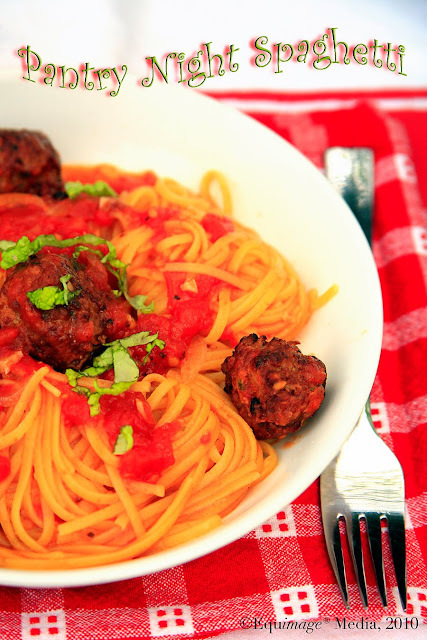 Divide pasta into three or four portions arranging meatballs and additional sauce on top. Top each serving with a sprinkle of reserved basil and with Parmigiano Reggiano or Grana Padano cheese if desired.